Welcome to Best Western Inn at the Rogue! Maybe you're staying at our Grants Pass hotel to tour the numerous wineries in the region, or maybe it's the world-class fishing that's caught your eye. No matter what brings you to this part of the Pacific Northwest, our Grants Pass hotel will make your stay even better. Fishing, rafting and boating are all favorite activities for many of our guests. Take a trip on Hellgate Jetboats and see first-hand some of the wild rapids in the area. River activities, hiking and wine tasting are all par for the course when you stay in southern Oregon. Convenience to I-5 makes us a favorite for those en route to California or Canada. 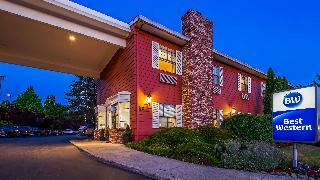 Located right off of I-5 on Exit 48, it only takes a few minutes to get to our Grants Pass hotel. The Rogue River rushes through town, and it's a siren's call that can't be ignored for many outdoor lovers. We're right across the street from Fleming Memorial Park and a boat launch. Access to the water is why many guests choose to stay with us. While our proximity to Rogue River is unbeatable, it's our customer service that really stands out. Even if you're just here for the whitewater rafting, you deserve to be treated like family and that's what we promise. Our warm welcome, luxurious bedding and quiet rooms lay the foundation for the trip of a lifetime. From jet boat excursions to our highly-rated customer service, staying at our property ensures your trip is off to a great start. Our Grants Pass hotel is central to just about everything in southern Oregon. We are the perfect home base for day trips to Crater Lake National Park and/or the Oregon Caves National Monument. Even business travelers with DishÂ® Network, Murphy Plywood, the US government and the State of Oregon squeeze in a little time for enjoying the rapids. Whether you're here for business or to tackle another class of rapids, where you stay makes a huge difference. Book a room at Best Western Inn at the Rogue!